A few months ago, I wrote a post that introduced the idea of experimenting with the Archive’s cache of high-resolution digital photography in Photoshop. Experimentation has continued and has provided some interesting results. It’s difficult to label the experiments as successes or failures—the stakes aren’t that high yet. But in the DH/Zen-like spirit of play and working-without-aiming, let’s continue with the fun. Even while preserved under the best circumstances, manuscripts always start to show their age. With unfinished manuscripts, particularly, much of the revisionary or provisional markup is done in pencil, which doesn’t hold up well over time. This current Photoshop experiment is an attempt to recover some faded text in the effort to make it more legible. 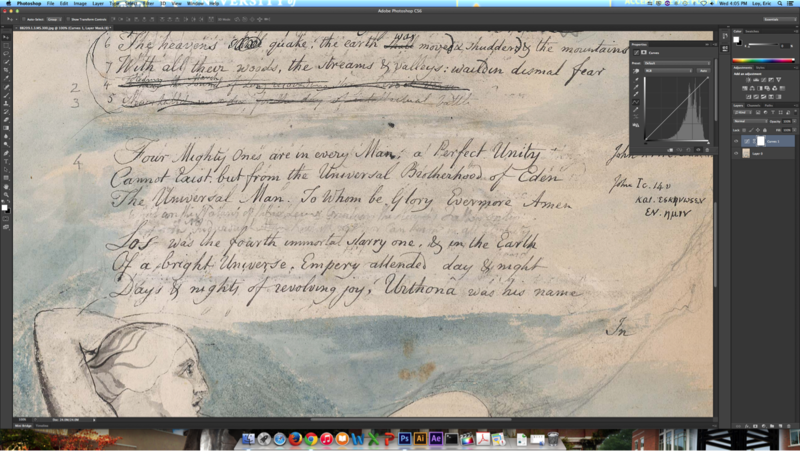 To illustrate the technique, I’ll first use a page from Blake’s Four Zoas that features a pencil drawing and some text below it. In this case, the adjustments are applied across the entire image file. 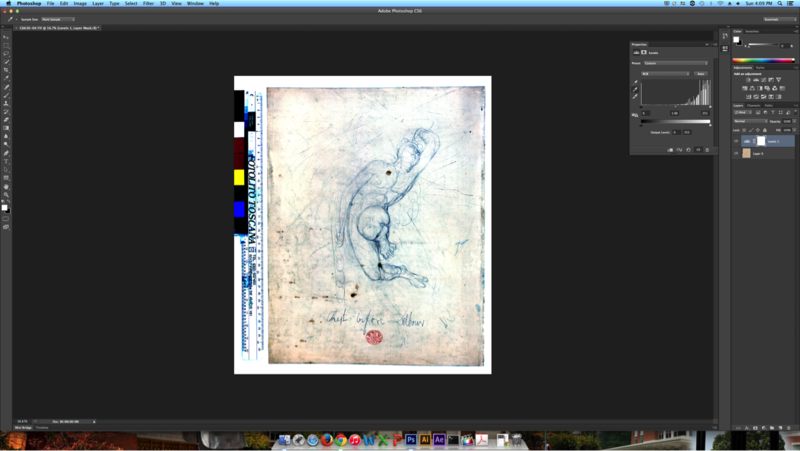 Then I’ll apply the technique to a few lines of faded text from another page in the Four Zoas. In this case, the adjustments are applied to only a selection of the image file. Step 3: Now that we understand how level adjustments are accomplished, let’s play around a bit. Using the eyedropper tool, I set the black level using a pencil mark as a target. In this case, I used a letter at the bottom of the page. Step 6: I set the gray level by using the eyedropper tool on another, lighter pencil mark. When we compare the final edited image with the original, certain textual features do become exaggerated and more legible. It’s important to remember that this method is only a modified form of the color correction we already do to every image in the Archive. That means it’s easy to learn, teach, and implement. I also found it easier to control than other adjustment tools in Photoshop like the Curves Tool. I’m hoping that in the future Photoshop techniques like these can help solve problems of transcription. 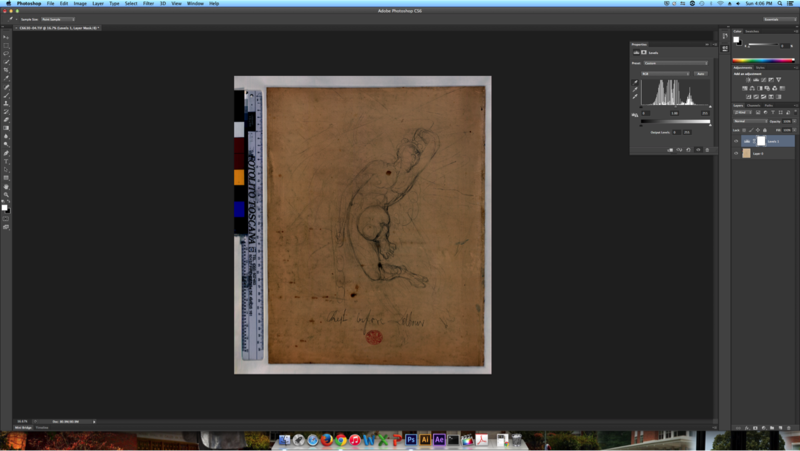 High-res photography and the technical abilities of software like Photoshop offer an opportunity to non-destructively experiment with rare and protected documents. It’s also much cheaper and faster than other options like multispectral imaging. 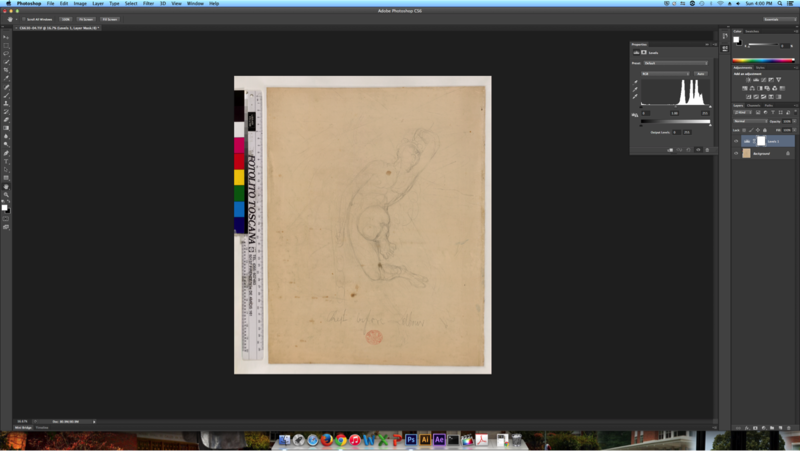 I also like the idea of offering edited images as appendices or editorial apparatuses to the Archive’s digital editions. 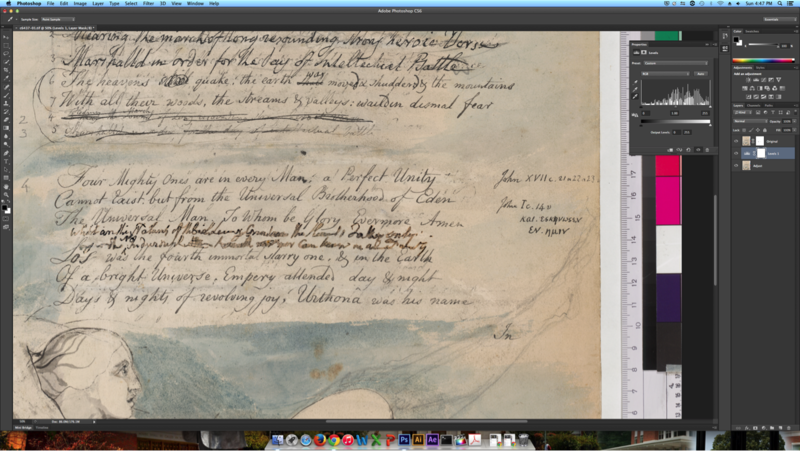 Edited images could be used in our existing editorial notes to help explain some of our transcription decisions. In any event, a great deal of thinking and theorizing is needed to contextualize this kind of work and its place in the editorial process. However, the prospects this kind of work raises are undoubtedly intriguing. Pingback: Blake In Photoshop, Part 2: Recovering Faded Text | Uncategorized | Aggregated blogs on Romantic Studies - please click through to read full posts.